Dummy or not to Dummy? Before having children I was one of those people who used to think ‘I will never give my child a dummy’. Well……. Benjamin loves his dummy during his day sleeps and more recently I have caved in and given it to him at night as well. We are trying not to use it out of the cot at all. But why why why did I hold out on giving him a dummy at night for so long. I worried about it for months and got up two, three and sometimes four times in the night (especially when teething). I have had the most amazing sleep at night since he has the dummy. The past week he has been sleeping from 7.15pm to 7.15am. We even had a lovely sleep in until 7.45am. Anyone who knows me well knows that I am not a morning person. So thank you to the dummy and thank you to my little man!! To all those non dummy users out there who are getting up at night…… convert and get some sleep! Author BelindaPosted on June 2, 2008 February 4, 2011 Categories Benjamin, FamilyTags baby, Benjamin, dummy, pacifier, soother1 Comment on Dummy or not to Dummy? I managed to put some Bonjella in Benjamin’s mouth today (he locks his lips tight most of the time) and counted five or six teeth cutting through. Poor little man. But at least they are all coming at once and the pain does not have to be prolonged!!!! Bonjella is wonderful stuff!!!!!! 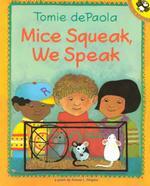 Author BelindaPosted on June 2, 2008 February 4, 2011 Categories Benjamin, FamilyTags baby teeth, Benjamin, teethingLeave a comment on Nasty Teething! Ben loves books, which we are very happy about as I have a huge collection from being a teacher and have a great love of children’s books. I thought it would be nice to record his favourites from month to month. He knows what he likes. He chooses books himself and will bring them to you to read but will also push a book away if he doesn’t like it. He has a book cupboard which he sits at daily and pulls out books and sits and reads them. We seem to accumulate a small pile of books to read at bedtime and If I try to skip some he digs to find them in the pile. 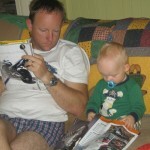 Benjamin and Andrew also like to read the magazine – Australian Motorcycle News. 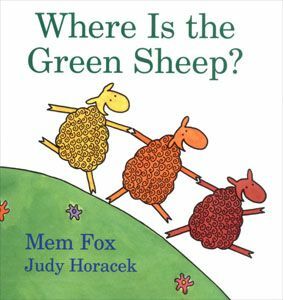 His favourites at the moment are: “Dig Dig Digging” by Margaret Mayo and Alex Ayliffe, “Mice Squeak-We Speak” by Tomie do Paola (A poem by Arnold L Shapiro) and “Where is the Green Sheep?” by Mem Fox and Judy Horacek. 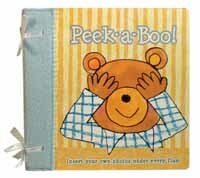 He also likes to read “Peek-a-Boo” by InnovativeKids. I have put photos of us in this book and he is beginning to tell me who it is. 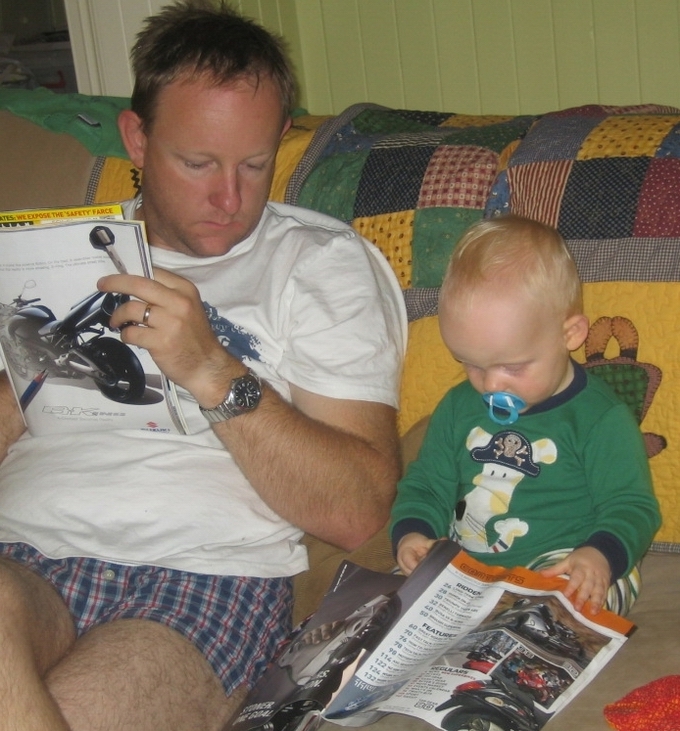 It is such a joy to read with him. Tonight we thought it was about time that we started to go out for dinner. So of course it was off to Hoggies! 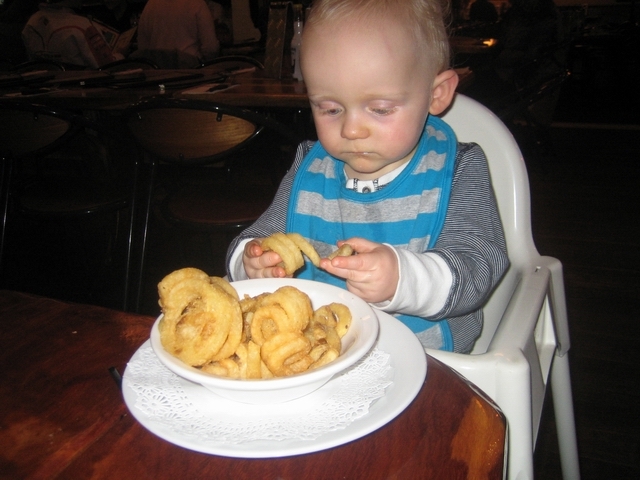 Ben had his first curly fries (as well as his usual veges etc). In hind sight maybe tonight wasn’t that great of a choice as Ben had no afternoon sleep. He didn’t scream the place down or anything but he was demanding and a little grumpy. Although he did flirt with the waitresses. We both remembered eating out used to be much easier. We live in hope that one day it will be again!!!! Ben just needs lots of practise. Another milestone was reached today!!! Ben stood tall not hanging onto anything. It may have been for only about five seconds but he did it. What makes it so lovely is that both Mum and Dad (Belinda and Andrew) saw it. How lucky are we!!! What’s with all the worry!!! It’s Belinda here (my first post). Since Ben has been born I have worried about everything – he’s not asleep, he’s asleep to long, he’s not eating, he’s not crawling, he can’t have dairy, he’s got wind ………………. I have even woken him up to see if he is ok (what an idiot!!!!). All this worry gets in the way of enjoying being a mum. I am so lucky I don’t have to go back to work. I have the time to enjoy all the little things. But at times I find myself fussing and worrying about ridiculous things. Andrew has been overseas this week for work so It has been Ben and I at home. He has had a cold and we have been to the doctors twice. We went to the doctors today and I could hear Andrew in my head ‘You’re fussing, relax, it’s ok’. The doctor was pleased to see Ben but said he is on the mend and there is no need to worry. He also was able to have a look in Ben’s mouth (something he rarely lets you do) and said he is cutting a pile of teeth…… but I’m getting off the topic. But anyhow…. I’m getting to my point. At the chemist today when we filled the script, the lady behind the counter waved goodbye to Ben and said ‘bye’ as we were leaving. Ben smiled, waved goodbye and said ‘bye’. My heart melted. Also on the way to the car he waved and said ‘bye’ to everyone who looked at him and some that didn’t. Also on the way home in the car the song ‘If you are happy and you know it’ came on. Ben was doing his clap and lifting his arms and saying ‘hooray’ which he says more like ‘yaaaay’. It’s his latest trick. These little milestones – the waving, saying ‘bye’ and ‘yaaay’. Make you realise how ridiculous all the worry is. I have had him at the doctors twice this week, fussed and worried about him. When I failed to realise that yes he has a cold but his happy!!! The chemist (who was behind the back counter) even popped his head out and called Benjamin a ‘happy chappy’ because he was chatting a way in his pram. He will only be little for such a short amount of time. I need to lessen the worrying. I need to embrace and enjoy all the milestones and happy days before he is all grown up………cos’ he is a genius you know?!!! 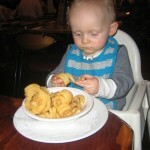 Author BelindaPosted on May 31, 2008 February 4, 2011 Categories Benjamin, FamilyTags Benjamin, happy baby, Milestones, mum, teeth, worryLeave a comment on What’s with all the worry!! !